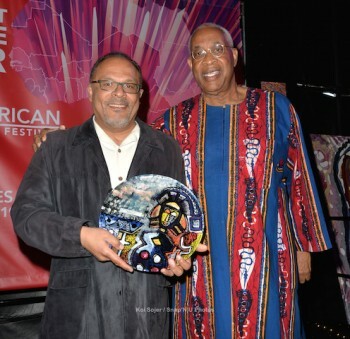 The 26th Annual Pan African Film & Arts Festival (PAFF) wrapped Monday after 12 days of showcasing an impressive slate of 173 films. The annual festival, which is now in its 26th year featured 75+ fine artists and 170+ new films from over 40 countries withi n five continents and in 26 languages. At the awards brunch held at the Baldwin Hills Crenshaw Plaza, PAFF Executive Director, Ayuko Babu, presented various awards to competing filmmakers who have proven to be the greatest up-and-coming storytellers of our time. “Love Jacked” a romantic comedy which features Mike Epps and Keith David received the Programmers’ Award – Narrative Feature, Woye Apolline Traoré’s moving drama “Borders,” earned Best Narrative Feature for the female director. Other winning entries included Samuel D. Pollard’s documentary on the iconic Sammy Davis, Jr which received Best Documentary. Established in 1992, the Pan African Film & Arts Festival (PAFF) showcases a broad spectrum of Black creative works; particularly, those that reinforce positive images and help to advance cultures, races and lifestyles. PAFF also serves as a vehicle to initiate dialogue on the important issues of our time and aides in the promotion of cultural understanding between peoples of African descent. The 27th Annual Pan African Film & Arts Festival will take place Thursday, February 7 through Monday, February 18 in Los Angeles, California.